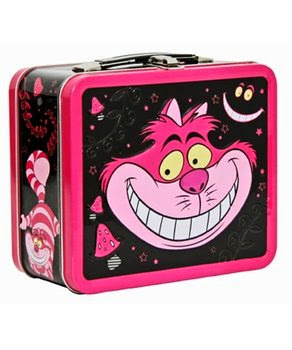 I just bought one of these Loungefly Cheshire cat lunchboxes for my goth friend while visiting the incredibly cool Rocket Fizz shop in San Diego. She's going to store candy in it, but I bet the candy won't last for long, as she's a sugar fiend! The lunchbox is also sold on eBay, but very few are offered at any given time. If I'd known how hard these were to get ahold of, I might have indulged and gotten myself one at Rocket Fizz too!